LCD panels are now the predominant medium for reviewing PACS images; however, a large number of hospitals worldwide still use Monochrome CRTs and Color CRTs displays. 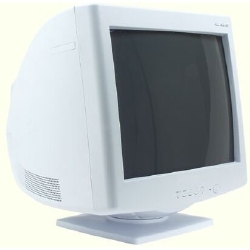 Original equipment manufactured by Conrac, Coulter, GE, Hitachi, Siemens, Toshiba and many others are available as new, off-the-shelf CRTs from an extensive inventory and cross-reference database that allows you to select from many different systems and manufacturers. Many of these "legacy" displays operate at odd frequencies and refresh rates, and receive non-standard video signals. As they age, the brightness and spatial resolution of these CRT-based displays become compromised, resulting in poor image quality. Medical Displays for Less makes it easy to replace these failing CRTs. Call or email us for a "plug and play" CRT replacement from our large selection.